At this year’s ALPSP annual conference (Windsor, October 2018), there was an entertaining session called “What’s New in Digital Humanities”. Of the three speakers, one was by Peter Berkery, the Director of the Association of University Presses, one by an academic, Paul Spence – a lecturer in a department of digital humanities, no less, so he should know – and the last, the most entertaining, was by Etienne Posthumus of Brill Publishers, a commercial publisher. Mr Posthumus was entertaining because he was prepared to question some givens; during his talk he roundly criticized XML, for the very good reason that the slightest error in an XML document makes the whole thing fail to process, unlike HTML which at least makes an effort to produce a result. The other two talks described no doubt fascinating Digital Humanities initiatives, each of which was funded by a philanthropic institution. To be fair, these initiatives are not just about publishing one title, but providing tools for humanities titles to be published. Why not just publish a monograph like any scientific author would do? Alan Harvey, of Stanford University Press, explained that the goal of digital humanities is “not to publish a book in digital form … [but] embedding the scholarly argument within the digital object”. Whatever that means. In the context of that kind of statement, Posthumus asked why there should be such a thing as digital humanities. After all, we don’t talk about digital physics, or digital astronomy – we just talk about physics or astronomy. This made me ponder; now I think about it, in my experience, the term “digital humanities” has sometimes been used to describe, not mainstream publishing projects, but some pet project by an academic to use vast swathes of highly specialised technology to create a niche publication, such as an annotated edition of an author’s manuscripts, including all the annotations and corrections, with custom functionality that might not be relevant for any other publication. To check my theory, I asked a publisher responsible for humanities publishing at one of the major academic publishers what his view of digital humanities was. No such thing, he said – there is just publishing. Whatever tools and techniques are used for publishing apply also to humanities; digital humanities is not a special case. Next time I attend a conference session on digital humanities, I will ask why digital humanities should be different. 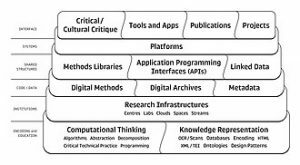 Paul Spence defined digital humanities as “the interpretation and visualisation of highly structured content”, but I fear such a definition argues for humanities becoming more side-tracked when it should be stressing what it has in common with other academic disciplines.